My daughter and I are also dairy free - here's a few of the things that make our life easier! 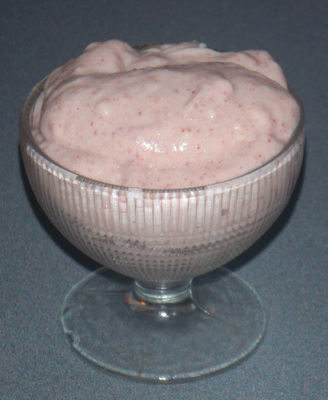 See my page on "ice cream" and blender ices too! I read recipe all over and did sort of a mash up - but it was successful! The picture doesn't look very appetizing but its not bad with some fruit or on apple crisp or waffles! First warm the milk until it is 115' and remove from heat. Sprinkle with the gelatin and whisk well. Add stevia and vanilla (if using). Your milk should be a bit cooler now from all the stirring (less than 100'). Stir in the probiotics. Leave in the oven with the light on (oven off) or in a dehydrator set at 100' for 24 hours. Refrigerate until set (2-3 hrs). Here's a picture after adding 2 mini scoops stevia, 1-2 Tbsp maple syrup and 1 cup s/f strawberry jam and whipping. Kid approved! Its very good! I do not drink oat milk but I use it as an inexpensive milk to bake with! Add 1/2 tsp salt to your milk and perhaps a little vanilla or sweetener if you plan to drink it. I tried this vegan cheese. Its pretty good - but don't think cream cheese when you eat it ! I do think its best if you haven't had real cheese in a while but its a great high protein, tangy, spreadable/mixable option! Puree with the probiotic until its smooth. you will need a high powered blender. I have a ninja and had to scrape down the sides quite a few times. Just keep on blending!!! Wrap it in cheesecloth and put in a strainer over a bowl in a warm place (I used my dehydrator) for 12-15 hours. Then put it in the fridge. It firms up quite a bit more in the fridge. This has no salt in it - I have added salt every time I used it. It just doesn't taste cheesy without salt. It is great mixed with ranch spice mix and spread on crackers! Can't wait to make a Christmas cheese ball with it! The cheeseball was delicious! I used 3/4 of this recipe with 2-3 Tbsp ranch spice mix and 2 Tbsp lemon juice and a bit of salt - rolled it in walnuts! Dairy Free Cream Cheese: http://www.theveggietable.com/blog/vegetarian-recipes/condiments-dressings/mock-cream-cheese/ Tofutto seems to have the best recommendations for a commercial one - I'm trying Daiya tomorrow - I'll let you know! Open it carefully and scoop out the thick fat off the top (save the rest for smoothies!) Be careful not to take any of the "milk" since it will make your cream not whip. Add a bit of sweetener if you like and whip it on high until its fluffy.